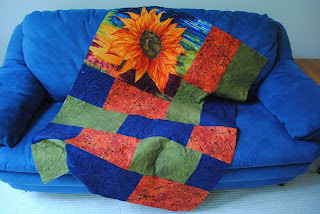 I finished quilting my latest donation to our Love and Comfort Quilt Project on Friday. It still has to be bound but I suspect I can get that done by our next meeting. I used the flower piece that I blogged about in mid-October. 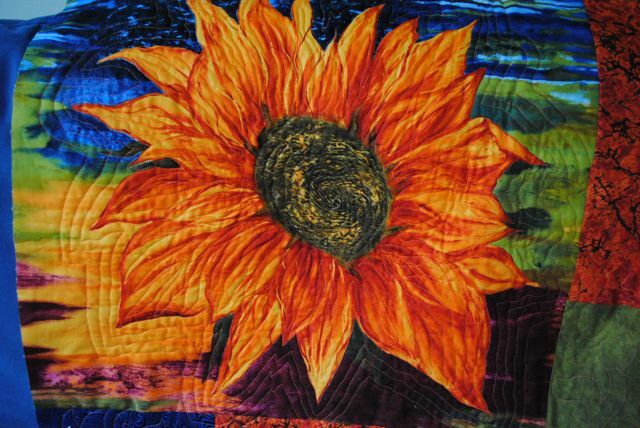 I try to keep my comfort quilts very simple and then use the quilting as an opportunity to work on my free-motion quilting. I also decided to try angling my machine while I was quilting - a tip I mentioned in my last blog entry. With the angling, I found it much easier to maneuver the quilt on my machine. The flower was definitely the most fun part to quilt. For each of the blocks, I used a contrasting thread and played with designs. While the pattern is very straightforward, I think the quilt will brighten someone's day! I agree, wonderful contribution. I am sure the new owner with love it. Happy to discover you and your blog, Judy. I'm from New York State, as well -- could we be neighbors?? We're definitely Sisters in The Cloth! I am a couple of hours west of you near Rochester at Exit 45 on the thruway. Just checked at your blog. Your flying geese piece has my head spinning - the seam allowances look really complex but absolutely fascinating! Will look forward to seeing more. Thanks, Linda for the complement. I finished the binding yesterday and it feels really nice. I am sure it's owner will be happy with it.